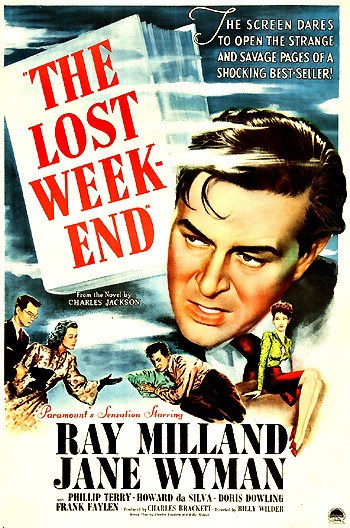 The Lost Weekend (1945) is a serious, painful and uncompromising, frank look at alcohol addiction that follows almost five days ('one lost weekend') in the life of a chronic, tortured alcoholic, and failed writer. The dark-tempered, melodramatic social-problem film was both a critically- and financially-successful endeavor. This was Billy Wilder's fourth directorial effort, after The Major and the Minor (1942), Five Graves to Cairo (1943), and the classic film noir Double Indemnity (1944). The film was given a subtitle for its British release: The Lost Weekend: Diary of a Dipsomaniac. It was also a revolutionary, ground-breaking motion picture - because it was the first time that Hollywood had seriously tackled the taboo subject and created social awareness of alcoholism as a modern illness. Previous films had only made fun of drunks and lushes (e.g., The Thin Man series, or W.C. Fields' films). Its release was threatened when the alcohol industry offered to purchase the film's negative and remove it from circulation, but then praised and supported the film following its popular release (and critical success). You've never played a picture like THE LOST WEEKEND. It is a new kind of film....the story of five dramatic, terrifying days of a chronic alcoholic's desperate fight to regain his lost soul. It pulls no punches, but handles its subject sincerely and straightforwardly. It is not a preachment, but the most stirring kind of dramatic entertainment. Miklos Rozsa's eerie score featured the first use in a feature film of electronic music - from an instrument called a theremin that produced oscillating, wailing, other-worldly sounds to express the drinker's distorted perceptions of reality during the nightmarish sequences. The Screen Dares to Open the Strange and Savage Pages of a Shocking Best-Seller! The film was nominated for seven Academy Award nominations and received four major accolades: director Billy Wilder scored a double-win, both as Best Director (Wilder's second directorial nomination and his first Oscar win), and co-writer of the Best Screenplay (his fifth screenwriting nomination and first win). Popular matinee idol Ray Milland, cast against type, won the Best Actor award for his greatest career role as the hopelessly-obsessed drunkard, and the film also captured the Best Picture Oscar, defeating nominees including Hitchcock's Spellbound and Leo McCarey's The Bells of St. Mary's (both with Ingrid Bergman), Michael Curtiz' Mildred Pierce, and the musical Anchors Aweigh. Its other three nominations were Best Score (Miklos Rozsa), Best Film Editing (Doane Harrison), and Best B/W Cinematography (John F. Seitz). Jane Wyman also was cast in a different role than her normal characterizations as a bright, loving, patient and happy screen ingenue. It was the first Best Picture Oscar winner to also win the Cannes Film Festival's top prize, now known as the Golden Palm (Palme d'Or). The film had enormous impact, especially upon returning combat-fatigued GIs from WW II who were adjusting and struggling with their own difficulties in civilian life and often turning into alcohol dependents. In fact, its success spurred further black and white, post-war dramas dealing with social-problems, e.g., returning war veterans in The Best Years of Our Lives (1946), anti-Semitic prejudice in Gentleman's Agreement (1947), treatment of the mentally-ill in The Snake Pit (1948), and political demagogues in All The King's Men (1949). After the credits, The Lost Weekend opens with a panning, left-to-right cityscape view of New York City. [The film, possessing a circular structure, ends with a pan moving in the reverse direction.] The camera slowly zooms in toward the third window on the side of a brick building where a half-full whiskey bottle hangs from a rope attached to the window crank. Don Birnam (Ray Milland) and his devoted brother Wick (Phillip Terry, Joan Crawford's ex-husband #3) are inside their shared, top floor apartment packing for a proposed five-day, extended "long wonderful weekend" trip by train to a country farm where there will be "trees and grass and sweet cider and buttermilk, and water from that well that's colder than any other..."
A struggling, wanna-be writer who has been off-the-wagon for ten days, Don is determined to get back to his compositions: "I'm gonna write there - get started on that novel." But Don, deviously and secretly, has hidden bottles of booze throughout his New York apartment. He is desperate for another drink, but wishes to conceal his 'weakness' and hopeless passion for booze from his crusading, responsible brother. Do you think I wanted you out of the apartment because of the bottle? I resent that like the devil. If there's one more word of discussion, I don't leave on your blasted weekend. There isn't a store or a bar that will give him five cents worth of credit...I went over the apartment with a fine-tooth comb - the places he can figure out! Don's mounting desire for booze compels him to frantically search in all his favorite, obscure hiding places - in the medicine cabinet, behind a heater grating in the bathroom, in the vacuum cleaner bag, and behind his bed. When the cleaning lady Mrs. Foley (Anita Bolster) buzzes at the door, he refuses to let her into the apartment. He steals her $10 wages left by his brother when she inadvertently mentions that the money is cleverly concealed in the lid of the sugar bowl in the kitchen. Debasing himself in order to mis-appropriate her earnings, he tells her that she will be paid the following Monday. He hastily rushes to the nearby liquor store to purchase two bottles of rye. The bar scene is shot through a lined-up row of whiskey bottles - a pitiful alcoholic, Birnam orders two bottles of rye from the store owner (Eddie Laughton): "You know what brand, Mr. Brophy. The cheapest. None of that twelve year old aged in wood - not for me." Even his ploy of covering the top of his brown-papered bag with apples from an open-air market doesn't fool two gossipy old ladies on the street: "That's the nice young man who drinks." Don't wipe it away, Nat. Let me have my little vicious circle. You know, the circle is the perfect geometric figure. No end, no beginning. To Don's mild consternation, she cheapens herself by shortening her words in her speech: "Why imperil our friendship with these loathesome abbreviations?" (she says 'ridick' for ridiculous, and 'natch' for naturally). He casually turns down her offer to get together later in the evening. As she glides away from him, she strokes his hair again ("Just crazy about the back of your hair"), points her index finger at him, and clicks her tongue as she shoots. Wick: He won't accept our help. Not Don, he hates us. He wants to be alone with that bottle of his. It's all he gives a hang about. Why kid ourselves? He's a hopeless alcoholic. The scene dissolves back to a close-up of the surface of the bar counter where twelve damp rings are now visible - double the amount of drinks consumed from before. Roaring drunk and oblivious to time's passing - almost a half-hour late, he arrives home just as Wick calls for a taxi and departs for the country alone. Don overhears Wick's final words of advice to his own faithful girlfriend: "Let go of him, Helen. Give yourself a chance." Avoiding his well-meaning fiancee, Don stealthily climbs the stairs and determinedly locks himself inside his apartment to enjoy a private, self-absorbed weekend of boozing by himself. He hides one of the bottles in an overhead lighting fixture. As he relaxes in his easy chair with the second bottle and breathes a sigh of relief, a zooming close-up of his drink glass fills the screen. I can't cut it short. I'm on that merry-go-round. You gotta ride it all the way. Round and round until that blasted music wears itself out and the thing dies down and comes to a stop...At night, the stuff's a drink. In the morning, it's medicine....It's a terrifying problem, Nat, because if it's dawn, you're dead. The bars are closed and the liquor stores don't open until nine o'clock and you can't last until nine o'clock. Or maybe Sunday, that's the worst. No liquor stores at all, and you guys wouldn't open a bar, not until one o'clock. Why? WHY, Nat? Gloria: (To Don) Sometimes I wish you came from Albany. There are a lot of bars on Third Avenue. Do me a favor, will ya? Get out of here and buy it somewhere else...I don't like you much. What's the idea of pullin' her [Gloria's] leg? You know you're not going to take her out...You're drunk and you're just makin' with the mouth...I know the dame, the lady, I mean. I don't like what you're doin' to her, either...You should have seen her come in here last night looking for ya. Her eyes all rainy, and her mascara all washed away...That's an awful high-class young lady...How the heck did she ever get mixed up with a guy who sops it up like you do?